Product prices and availability are accurate as of 2019-04-19 04:28:56 BST and are subject to change. Any price and availability information displayed on http://www.amazon.co.uk/ at the time of purchase will apply to the purchase of this product. 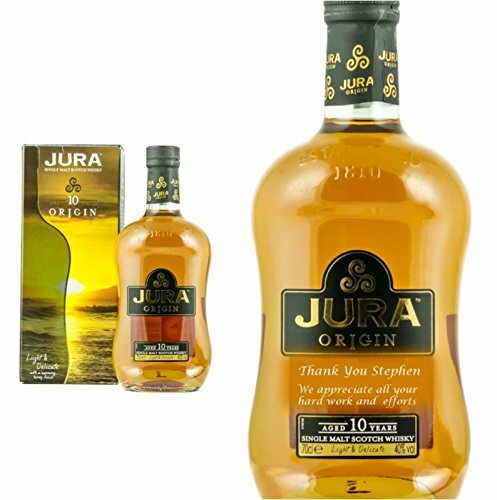 Personalised Isle of Jura 10 Year Old Origin Single Malt Whisky Bottle, makes a unique gift for any special occasion. Your engraved message will be etched next to the bottle label. The ideal gift for mother and fathers day, anniversary or Christmas gift. To add a personal engraved message to this bottle please use the gift message box when checking out. PLEASE NOTE: This product allows Three lines of text, MAX 30 characters per line. Engraved by Prestige Drinks LTD Personalised Bottles can not be returned or refunded.